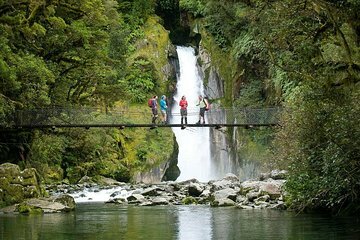 Get up close to nature and explore one of the top spots on New Zealand's South Island on this half-day Milford Track guided walk. Take a boat ride across Milford Sound to Sandfly Point with your guide and admire soaring cliffs and cascading waterfalls. Hike along the banks of the Arthur River and Lake Ada, and enjoy panoramic views over the pristine countryside. Admire the mighty Giant's Gate waterfall from the swing-bridge over the river and enjoy personal attention from your guide on this small-group tour, limited to 12 people.